There’s a fair few things I’m willing to go the literal extra mile for; a best friend, a handsome man, or in this case some really rather exceptional food. Having exhausted almost everywhere in my local town, I had rather fancied a change of scenery, even if just for an afternoon. When I calculated it had been over a year since I last paid a visit to The Garden Kitchen, I knew this simply must have to change. And so hit the road with my very best friend (my momma) one sunny Friday afternoon and travelled over to the not-too-far-but-far-enough town of Clitheroe. But you’re seriously missing a trick if you neglect the rest of the menu. Taking our seats at our sun-warmed table over-looking the garden nursery, we slipped into cosy mum-and-daughter-chatter, only stopping to admire the Kitchen’s decor or watch the restaurant’s native kitty sunbathe among the planted pansies. We sipped casually out of welly-boots filled with delicious chocolate shake as we perused the menu. Ordering a feast fit for Queens and being completely thrilled with its delicious arrival. A delightful arrangement of homemade chicken liver pate, crusty baguette, crostini’s, ‘proper’ honey-roasted ham, hunky wedges of Lancashire cheeses, stilton, homemade scotch egg and adorable pots of homemade chutneys. We dove in eagerly, both swiping our half of the scotch egg. We crunched into the mild, crisp coating which hugged the peppered sausage meat, glistening from the bright orange yolk. Our eyes-rolled in bliss as we proclaimed our love for the hand-sized tid-bit, and excitedly reached in for round two. No part of the platter was better than the other, from the cuts of ham topped with a forkful of their sweet onion relish, to the crumbly bites of cheese enjoyed with a sharp crunch of apple; all worked harmoniously together to create a smorgasboard to end all future smorgasboards. With extra chips (I have issues with sharing – but I’m working on it). Fish and Chips is a right of passage on a Friday, some might even say it’s the law. And this was a hum-dinger of a portion. An ample fillet of haddock, fried splendidly in the most more-ish beer-batter you’ll ever taste. The chips were chunky, man-sized chaps; my most favourite variety and were the perfect ratio of crispy crust and fluffy, snow-white filling – a total 10/10 (especially when heartily dunked into cool pools of bright red sauce. 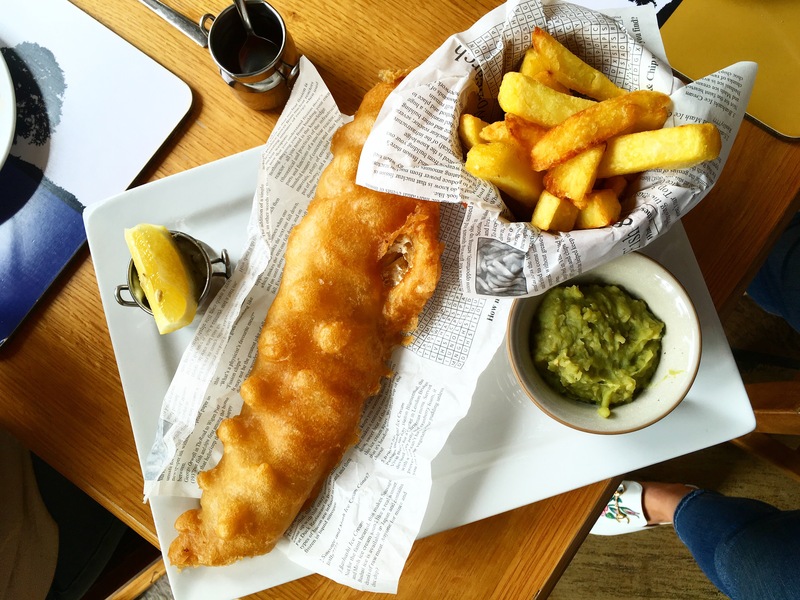 The mushy peas are an unmissable addition and only enhance the soft, mild bites of white fish, topped of with a sharp dollop of homemade, chunky tartare sauce. Utterly stuffed, but wonderfully so – we took to strolling around the farm shop and the grounds of the garden nursery to stretch our legs before heading home. The shop is stuffed with cute trinkets, preserves and the most adorable sweet treats for you to take home with you. It could be another year till you visit – so be sure to stock up on the essentials! (The chocolate bunnies are an absolute must). The staff at The Garden Kitchen are incredibly kind and attentive and the gardeners are always happy to chat through their favourite blooms with you! Just be sure to book before you go, despite being tucked away from the hustle and bustle, it’s a terribly known hidden gem and almost impossible to get in without a reservation. Take your most favourite people, order in abundance and have a fabulous time – I absolutely insist!